4/9/2015 // Bob Doster, Ph.D. The clinical usefulness of curcumin, the main active constituent of turmeric (Curcuma longa), has been limited by its chemical instability at intestinal pH values, by its low water solubility, and by its poor oral bioavailability and quick conjugation and excretion. These properties have led to less than ideal conditions for therapeutic use. The consequence is that several human studies of curcumin have failed to demonstrate benefit, even at high doses, and its full clinical potential is as yet unrealized. A new study, published in the Journal of Nutritional Science and Vitaminology1, has compared three popular curcumin formulations. This double-blind, 3-way crossover study compared plasma curcumin levels after the consecutive single dose administration of three commercially available curcumin supplements. The maximal level (Cmax) and total area under the curve (AUC) of plasma curcumin were assessed over the 24-hour period following administration. 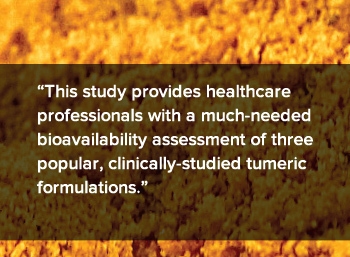 This study provides healthcare professionals with a much-needed bioavailability assessment of three popular, clinically-studied turmeric formulations. Click here for the full details of this study. 1Sunagawa Y, Hirano S, Katanasaka Y, et al. Colloidal Submicron-Particle Curcumin Exhibits High Absorption Efficiency - A Double-Blind, 3-Way Crossover Study. J Nutr Sci Vitaminol (Tokyo) 2015;61:37–44.